Friends of Toppenish Creek is dedicated to protecting the rights of rural communities and improving oversight of industrial agriculture. FOTC operates under the simple principle that all people deserve clean air, clean water and protection from abuse that results when profit is favored over people. FOTC works through public education, citizen investigations, research, legislation, special events, and direct action. Everywhere in the world alfalfa enriches the soil by fixing and adding nitrogen - Unless you live in Yakima County. According to the Lower Yakima Valley Groundwater Management Area (LYV GWMA) Report, alfalfa removes an average 236 pounds of nitrogen per acre per year from the soil, in our very special part of the world. According to the LYV GWMA Advisory Committee (GWAC) the universally accepted laws of science do not apply to us. If the GWAC did not like the data we simply threw it out. The GWAC did not like the fact that nitrate levels in monitoring wells north of Outlook reached 160 mg/L, 180 mg/L or 234 mg/L (safe nitrate for drinking is < 10 mg/L) - so we ignored those samples. The GWMA Plan, approved by a majority of the GWAC that included three major WA State agencies, is based on half-truths and outright falsehoods. It is a lesson in collusion and corruption. Please read this Minority Report from the Friends of Toppenish Creek carefully. It is a best effort to relate the six year history of the Lower Yakima Valley Groundwater Management Area and to tell Washingtonians how $2.3 million tax dollars were spent. Friends of Toppenish Creek is a 501(C) 3 non-profit environmental group that has been part of the Lower Yakima Valley Groundwater Management Area (LYV GWMA) since the beginning in 2012. FOTC files this report because the LYV GWMA has failed to deliver on promises to reduce nitrates in groundwater. In 2010, according to Lower Yakima Valley Groundwater Quality; Preliminary Assessment and Recommendations, about 12% of wells in the LYV had nitrate levels above the safety standard of 10 mg/L. In the last round of GWMA sampling 20% of wells had nitrate levels above the standard. 2. 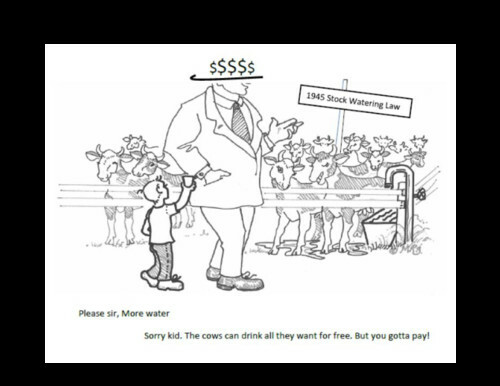 The dairy industry has maintained veto power over any and all GWMA actions. Advocates for dairy have controlled the agenda and marginalized other voices on the GWMA advisory committee (GWAC). 3. The GWMA leadership has failed to provide adequate research that is necessary in order for the GWAC to do the work. The GWMA has missed almost every deadline. 4. The GWMA gathered data and then, failed to analyze the data. The GWMA did no analysis of Deep Soil Sampling data, High Risk Well testing results, composting data, sampling of domestic wells and drains, or responses to a survey of public understanding. 5. GWMA contractors have not complied with the terms of their contracts. There were no consequences. A Nitrogen Availability Assessment was supposed to be the center piece of GWMA problem solving. It arrived 18 months late. The authors ignored bio-solids and waste water spray-fields, ignored the GWMA Deep Soil Sampling, ignored inputs from animals on pasture, ignored composting yards, failed to do a promised literature review and incorrectly stated that there is no leaching from alfalfa fields. They ignored nitrogen runoff to surface waters. 6. The GWMA has not addressed the impact of groundwater pollution on the health and well-being of the people who live in the Lower Yakima Valley. The GWAC has ignored Environmental Justice. 7. The GWMA has used up $2.3 million and left the program with no funds for implementation and no road map for how to obtain funds. In 2008 reporter Leah Beth Ward wrote a series of award winning reports entitled Hidden Wells, Dirty Water for the Yakima Herald Republic. Ward interviewed people who were afraid to drink water from their domestic wells and encountered difficulties when they went to authorities for information and assistance. She asked the U.S. Environmental Protection Agency (EPA) to investigate. The EPA began sampling water in the area and convened meetings where residents and other stakeholders discussed ways to address the emerging problems. That group recommended formation of a GWMA and Yakima County asked to be designated as the lead agency in a 2011 Request for Identification Lower Yakima Valley Groundwater Management Area. Very few of the Goals and Objectives in that document have been achieved. Nitrate contamination of groundwater is a world-wide problem that has grown over the last century due to an increasing population; man-made changes to the nitrogen cycle due to manufacture of chemical fertilizers; and an increase in confined animal feeding operations. Washington State ranks 12th in the nation for the percentage of the land surface with groundwater nitrates > 5 mg/L. Nitrates pose a health risk to animals and to people, especially babies. California, with severe water quality problems, spends millions of dollars every year on groundwater. There is no end in sight. In 2008 that state commissioned the University of California at Davis to study nitrates in drinking water. The LYV GWMA relied heavily on data from this comprehensive study while, at the same time, acknowledging that conditions in California and other impacted areas are different from those in the Yakima Valley. Early in the process the GWAC agreed upon the need for foundational work in order to analyze local issues. There was consensus on the importance of education and public outreach, a baseline survey of public understanding, an early Area Characterization, Deep Soil Sampling, a Network of Groundwater Monitoring Wells, and a Nitrogen Loading Assessment. Public Outreach: In 2013 Education and Public Outreach (EPO) created a public survey that was carried out by students from Heritage University. The EPO group worked with EPA’s Pediatric Environmental Health Services Unit (PEHSU) on a program to inform new mothers in the valley about the risks from using well water to mix baby formula. The EPO group facilitated free well water testing for 460 homes, presented bi-lingual material at five health fairs, supported radio presentations in English and Spanish and purchased billboard space that advised people to have their well water tested. Application of liquid manure is significantly more likely to result in high nitrate levels than application of solid manures or commercial fertilizer. A survey of conditions at well sites that was supposed to accompany the High Risk Well Assessment was not completed. Network of Monitoring Wells: Since 2013 the GWAC has studied plans for a network of purpose built monitoring wells. In January, 2017 the Pacific Groundwater Group signed a contract to oversee the installation of these wells. The county did not sign the contract until January, 2018. In early 2017 the U.S. Geological Survey signed a contract to sample those wells and test for nitrates. The terms of that contract have expired. As of October, 2018 there were no wells, no network and no plans for how to analyze the data if/when samples are collected. The GWAC discussed this topic over eight times during the past six years and repeatedly approved plans for groundwater monitoring. Nitrogen Loading Assessment: The GWAC agreed on the need for a Nitrogen Loading Assessment, a mathematical approach to nitrogen balance in the target area, in order to determine the contribution from various sources and to prioritize response strategies. The Washington State Department of Agriculture (WSDA) and Yakima County agreed to complete an NLA for the GWMA with a due date of December, 2015. The NLA did not arrive until April, 2017. By then it was renamed a Nitrogen Availability Assessment (NAA). WSDA and Yakima County did not follow the Scope of Work (SOW) for the study. Nitrogen inputs were missing for alfalfa fields, industrial spray fields, bio-solids and compost yards. Nitrogen runoff to the surface waters was ignored. 2017 Testing of Domestic Wells: Every two months during 2017 the USGS tested about 156 domestic wells and 24 agricultural drains in the target area on behalf of the GWMA. The data was shared with the GWAC but there was no evaluation. FOTC performed an analysis but our work was never discussed or approved by the GWAC. Proposed Solutions: In mid-2017 the GWMA leadership introduced over 250 proposed solutions to the nitrate problem, in spite of the fact that there was: no Area Characterization, no analysis of High Risk Well Testing, no analysis of the Deep Soil Sampling, no Nitrogen Loading Assessment and no Network of Monitoring Wells. Throughout the last half of 2017 the GWAC focused on refining this list. FOTC finds the process to be very flawed. For example, the initial list contained seven strategies that target domestic septic systems but no strategies that targeted composting operations or atmospheric deposition of nitrogen. GWMA Plan: The most recent GWMA timeline called for an approved plan by June, 2018. This would allow time for a State Environmental Policy Act (SEPA) review and public hearings on the plan before the GWMA contract expires in December, 2018. Once again, the deadline has passed. Between 12% and 20% of wells in the Lower Yakima Valley have nitrate levels > 10 mg/L. The problem is not evenly distributed across the valley. More wells in the southern portion of the GWMA target area are contaminated than those in the northwestern area. The highest groundwater nitrate concentrations are down gradient from dairies. Contributing factors are groundwater flow, depth to groundwater, soil characteristics, weather patterns, housing density, disposal of industrial and municipal wastes, and agricultural practices including: crop types, irrigation practices, fertilization, maintenance of lagoons/ponds, volatilization from production areas and cropland. In recent years the problem has expanded from shallow and aging domestic wells to deeper municipal wells. Since the early 2000’s the City of Grandview has monitored nitrate levels in its municipal wells closely and has blended water from several wells in order to deliver safe drinking water. In 2013 the City of Mabton drilled a new $1.85 million well to replace older wells that were troubled with decreasing water pressure and elevated nitrates. Area Characterization: The GWMA target area extends along the Yakima River Valley from Union Gap in the north to the Yakima/Benton County line in the east. The western border is the Yakima River/eastern boundary of the Yakama Reservation. The outermost occupied parcels, down gradient from the Rattlesnake Hills and the Horse Heaven Hills form the northern and southern borders. Soil is mostly composed of rich sediments that include Touchet Beds, loess and thick alluvial sands and gravels, and significant thickness of Ellensburg Formation. Half of the target area lies in the Toppenish Sedimentary Basin and half in the Benton Sedimentary Basin. Rainfall averages seven inches per year. Agriculture is the driving force behind the local economy. Irrigation from the Sunnyside and Roza Irrigation Districts serves about 96,000 acres of rich farmland. Major crops are apples, corn, triticale, grapes, alfalfa, cherries, mint, hops, wheat and asparagus. Since the late 1980’s dairying has assumed an ever increasing importance in the agricultural community. Over the past twenty five years the number of milk cows has increased at a rate of almost 3,000 per year. Increases in land planted in corn and forage have accompanied this trend. The population is about 70% Latino and is much younger than average for Yakima County or for the state. Many people are recent immigrants who speak English less than well. About 20% of the population lives below the poverty level and slightly over half have a high school diploma. Because the population is often non-mainstream and because pollution issues are prominent the potential for Environmental Injustice is high in the GWMA. The Yakama Nation has highlighted the impact of climate change on the valley. The USGS has documented declining water tables in the basalt aquifers. Groundwater from shallow aquifers in the LYV flows toward the Yakima River and is a major contributor to instream flows that are protected by treaties. The Yakima River Basin Integrated Water Resource Management Plan is intensely involved in seeking solutions to problems caused by over-allocation of this precious and limited resource. Insufficient understanding of nitrogen volatilization from animal agriculture and cropland that leads to poorly characterized atmospheric deposition of reactive nitrogen and an unquantified impact on the nitrogen balance. Yakima County’s Voluntary Stewardship Program relies on the GWMA plan for data gathering and evaluation of agriculture in the LYV. If the GWMA plan is weak this will weaken our VSP. WAC 173-201A-020 requires Ecology to approve and list BMPs that protect waters of the state. This has not been done. There are no Total Maximum Daily Loads (TMDLs) for nutrients for the Lower Yakima River, in spite of the fact that nitrogen and phosphorous concentrations in agricultural drains have not declined in recent years. Environmental groups believe that the 2017 NPDES General Permit for Concentrated Animal Feeding Operations (CAFOs) is weak and does not protect waters of the state. Industry believes the permits are too costly for producers. Yakima County with 35% of all Washington milk cows has no CAFO ordinance. What Will Happen If We Do Nothing? Groundwater quality in the LYV GWMA is worsening. Current efforts to address the problem are not working. If we do nothing different the future will bring falling aquifers with increasingly polluted water. Costs to future tax payers, our children, will escalate. 1. Everyone who lives in the LYV will have access to safe and affordable drinking water. No one will pay more than 2% of their income for bottled water. 3. There will be no more “bureaucratic runaround”. When people call authorities they will receive accurate and helpful information. Agencies and stakeholders have attempted to turn around the trend toward increasing nitrates in LYV groundwater since the 1990’s. Efforts to date, including the work of the LYV GWMA, have failed. The largest contributor to groundwater nitrates in the LYV is animal agriculture, namely CAFO dairies. FOTC firmly believes that the most cost effective way to solve the nitrate problem is to control the number of cows in the area.